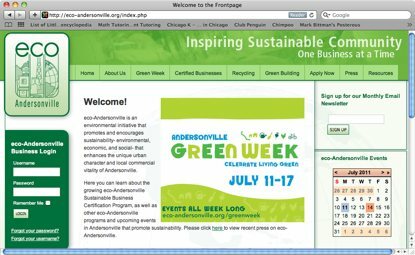 About 40 businesses in Chicago’s Andersonville neighborhood are participating this week in the community’s Green Week festivities. Local retailers, restaurants, and other businesses in the area are organizing, sponsoring and running many of the 50-plus events and activities taking place July 12-18. Events include local chefs offering cooking demonstrations of farmers market fare, art projects using recyclables organized by Sifu Design Studio, an eco-storybook activity at Green Genes boutique, and composting and rain barrel demonstrations. The Green Dream Group, a home energy audit firm, will offer tips on improving energy efficiency for homeowners, and i-Go Car Sharing, a non-profit short-term car-sharing company, is showing off a plug-in hybrid vehicle at a tent on North Clark Street throughout the week. Many neighborhood residents are organizing activities as well. The second annual event is the brainchild of the leaders at Eco-Andersonville, the sustainability initiative within the non-profit Andersonville Development Corp.
Aside from Green Week, Eco-Andersonville’s ongoing services include a green building incentive program and a sustainable business certification program to encourage local business owners to incorporate more green practices into their operations, according to Brian Bonanno, the group’s sustainable programs coordinator. Eco-Andersonville also established a streetscape recycling program for area residents and shoppers in its commercial area. Since 2009, the group estimates the aggressive recycling effort has diverted more than nine tons of recyclable waste from landfills, he said. Crain’s asked Mr. Bonanno and Ellen Shepard, executive director of the Andersonville Development Corp., how Andersonville and its businesses are benefiting from the Green Week happening and how they promote local shopping all year long. Crain’s: What does it mean to be a sustainable community? Ms. Shepard: In 2005, Andersonville made a choice to focus on being local as a way to be economically sustainable and that has worked for us. Most of the business owners here live in the neighborhood, and environmental sustainability was a natural outgrowth of that because they care about where they live and work. Andersonville is a tight-knit community where the residents are dedicated to supporting the businesses and vice versa. Because of that, the businesses continue to thrive, and the residential community thrives because we have this wonderful retail community that people want to be near. In other neighborhoods vacancy rates are up, but not here. Crain’s: What’s the goal of Green Week? Ms. Shepard: The goal is to highlight the businesses’ and residents’ commitment to sustainability, both environmental and social. We encouraged them to come up with their own program ideas to show how sustainability is part of their business practice, their life and their work. 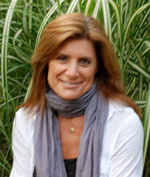 The ultimate goal is to show the different facets of sustainability. We have enough events with so much diversity that could engage anyone who attends. We want people to leave feeling they have a role to play in a more sustainable future. Crain’s: How are businesses participating in Green Week? Mr. Bonanno: We have local businesses sponsoring the overall Green Week, including Know no Limits (a neighborhood gym), A and N Mortgage Services, and Gethsemane Garden Centers. Many also are coming up with their own events, hosting and inviting organizations outside the neighborhood to show a film, do a workshop or a cooking demonstration. Transistor, a local music/book store/art gallery space, teamed up with non-profit Local First Chicago to host a film screening of “The Economics of Happiness”, a film about building a life based on relationships, not on stuff. The event highlights the company’s commitment to sustainability and should also attract foot traffic into their store. Three area businesses, including Hamburger Mary and Mightybytes (a media design company), sponsored an Amateur Brew Competition where they invited 15 home brewers to enter a competition at the restaurant for the best locally-made beer. They’re asking Green Week attendees to sample all the beers and choose a winner. And a neighborhood running store, The Runner’s Edge, organized a community 5K run and walk that will happen on July 17. The list goes on. Crain’s: Can you measure how neighborhood businesses benefit from Green Week? Ms. Shepard: The businesses get some bump that day, financially, and people come back later to shop as well. More people are seeking out businesses with a conscience and I think that will help those businesses in the long run. The less tangible part is that this event helps build the vibe of Andersonville. Crain’s: What can other chicago neighborhoods — and its businesses in particular — learn from this Green Week event? Ms. Shepard: Any business organization is always looking for ways to support and promote it’s businesses. Green Week is a great way to highlight that you care about your community. Energy is only going to get more rare and more expensive. Our whole culture and world is going to be less consumer-driven and more relationship and community-driven. Going green is the way of the future and the sooner people jump on the bandwagon, the sooner they’ll be building supports into their business district that will sustain them in the long run. In Andersonville, we believe this is the right thing to do. This entry was posted in Green Scene and tagged Andersonville, eco-Andersonville, events, green, GreenScene, Nemes. Bookmark the permalink. My blog is on Fitness classes. So glad you like my blog. You can subscribe by clicking on the third icon in the row at the bottom of any blog post. It’s right next to the FB and Twitter icon. Thanks and keep reading. You can follow me on Twitter as well: @JudithNemes.